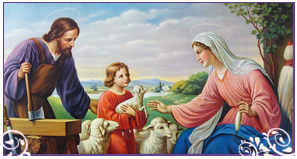 Mother's day is coming during the month of May - which is also the month we honor our heavenly mother, Mary. It's a great time to think about flowers! 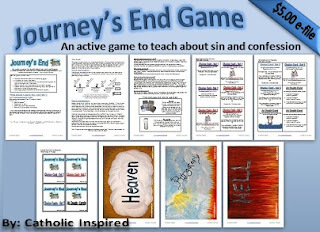 I'm added a new download to the members area! 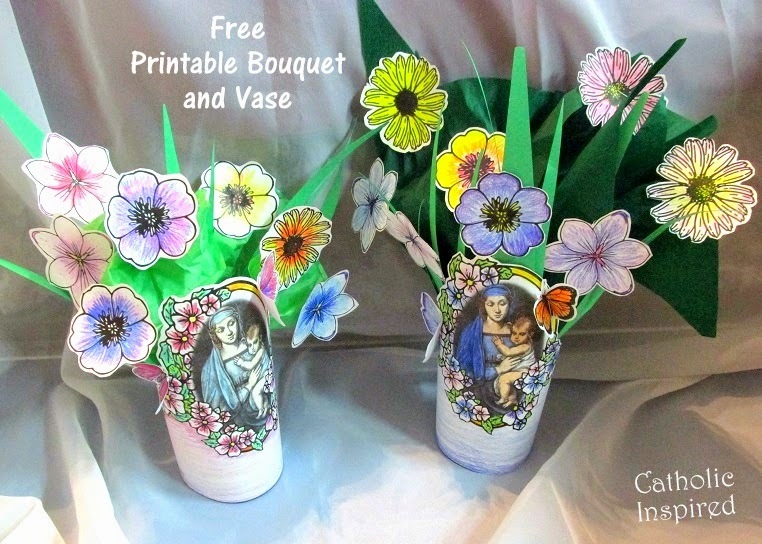 It's a printable bouquet and vase! 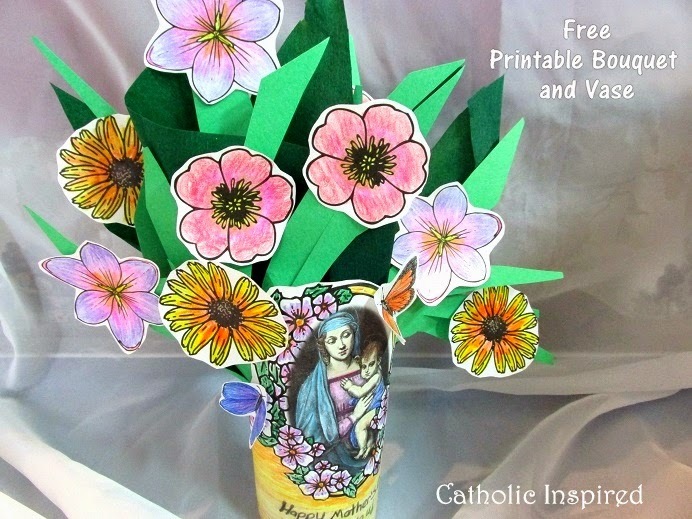 It has beautiful flowers and a sweet image of Our Lady holding the infant Jesus. 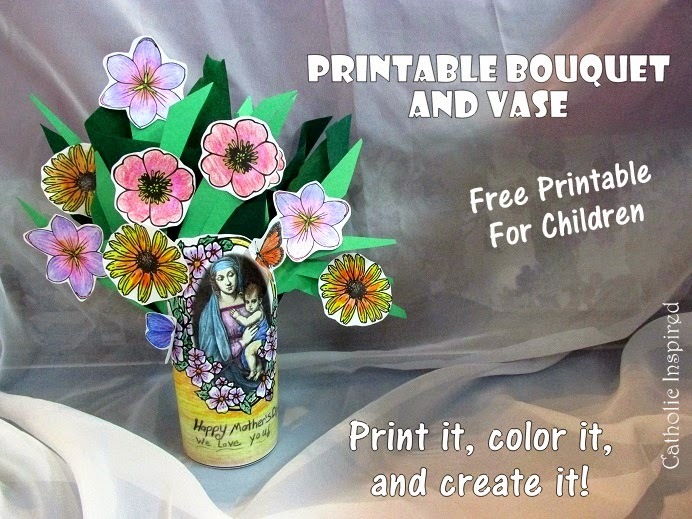 This paper bouquet is easy to make and could be a beautiful gift for mom or grandma. It also would be a beautiful decoration for your May altar or use it as a center piece for your table! 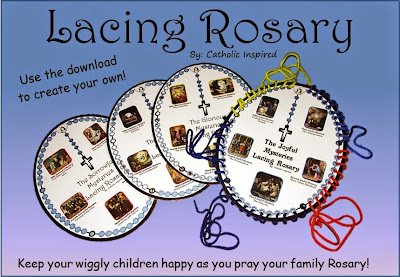 I know we will be using ours as decorations for our Mother Mary Tea party this year! First print the pages (regular paper is fine). 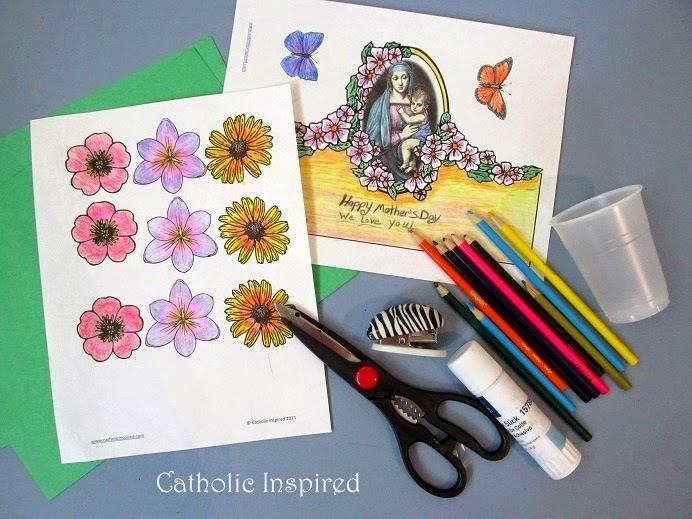 Color the Mary and Jesus image, the butterflies and flowers. 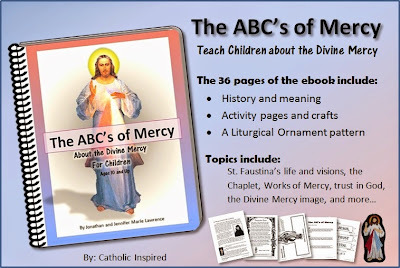 If you are giving this as a gift, you can write a message to the recipient in the boxed area below Mary. 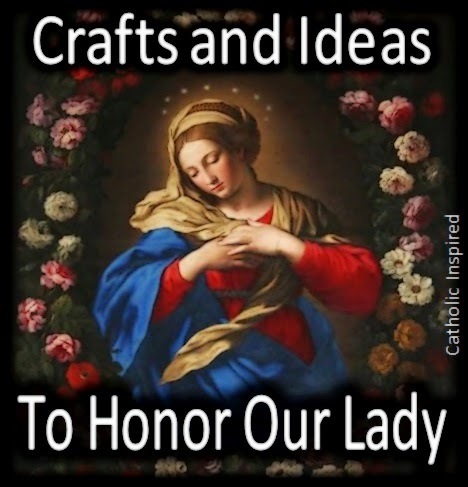 Note: the printable does not have the writing under Mary as it's pictured in the image above. We added that to this sample. Once you have colored it the way you like, cut out all the parts. Staple (or tape) the one end of the Mary box to the other - to form a tube. Add the 7 oz plastic disposable cup to the inside of the tube and staple the top of it to the top of the paper tube (in the back) Be sure it's sitting level before you staple it. Note: The paper tube is not tight around the cup. If you make it tight it is more likely to wrinkle and/or fall over. The plastic cup will help keep your flowers and greens from falling out. 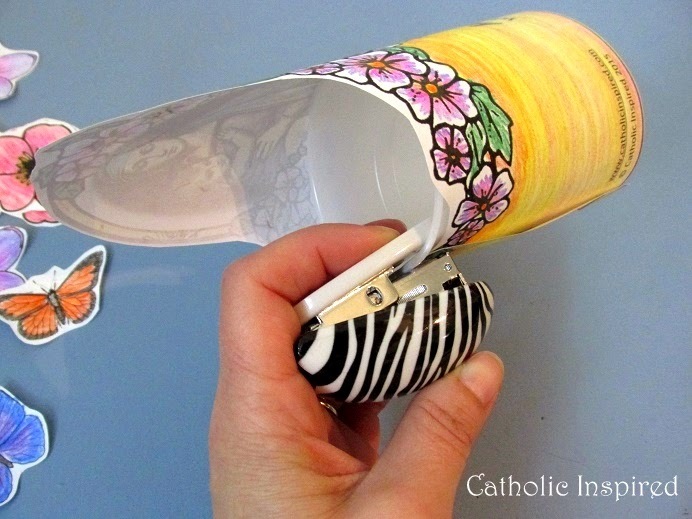 Now, fold the butterflies in half and open them up again. 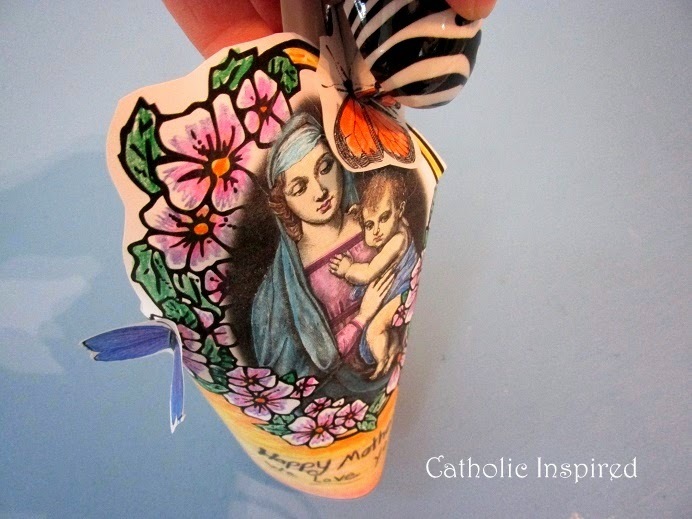 Staple the middle of the butterfly to the area around image of Mary. (or tape it down) This will give them a flying-3D look. Cut your sheet of tissue paper in half. Then cut each half in half again - diagonally. Take the middle of each part and form a point. Stuff the point into the cup along with some green leaf-like strips, which were cut from the green construction paper. 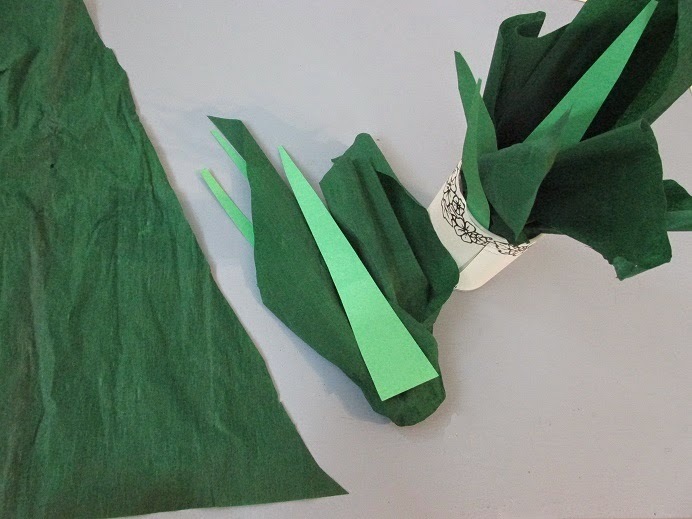 If you don't have green tissue paper you can just fill the cup with green strips of paper, but the tissue is a much better filler. Now fluff-out the greens and add your flowers. 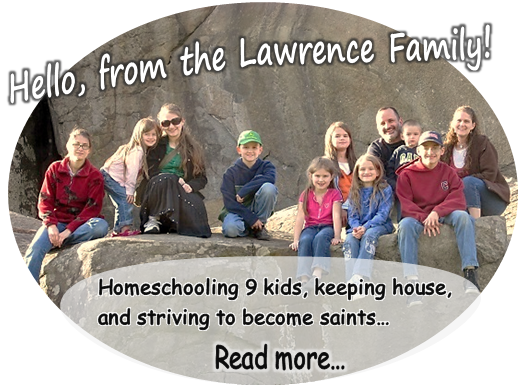 Some of my kids fluffed theirs out so much it made these kind-of top heavy. 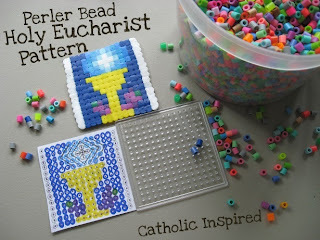 When they finished creating them they sat fine, but if it's frustrating to the child, add a few small rocks to the bottom of the cup. 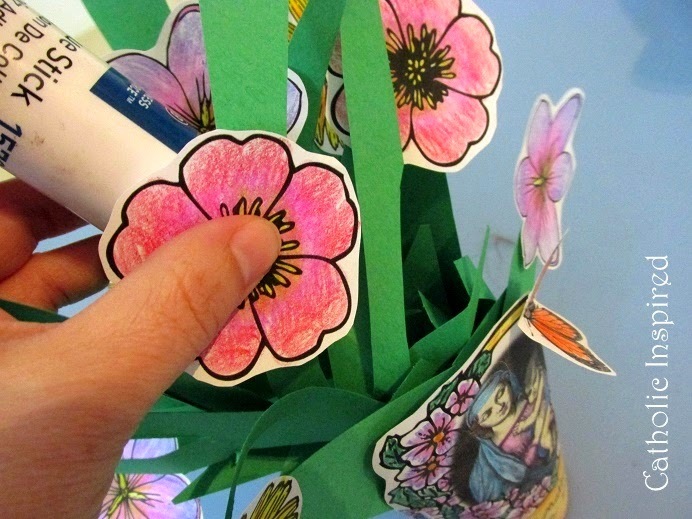 Use a glue stick to attach the flowers to the greenery. 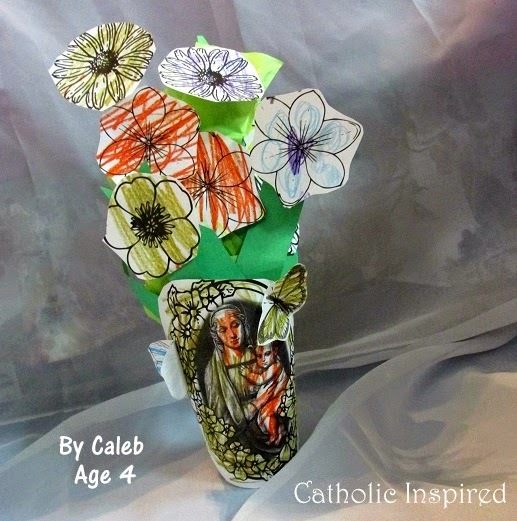 This bouquet craft can be enjoyed by a wide variety of ages. Obviously, the quality will not be as great for younger kids, but they can still enjoy it. Here is one my 4 year old made. 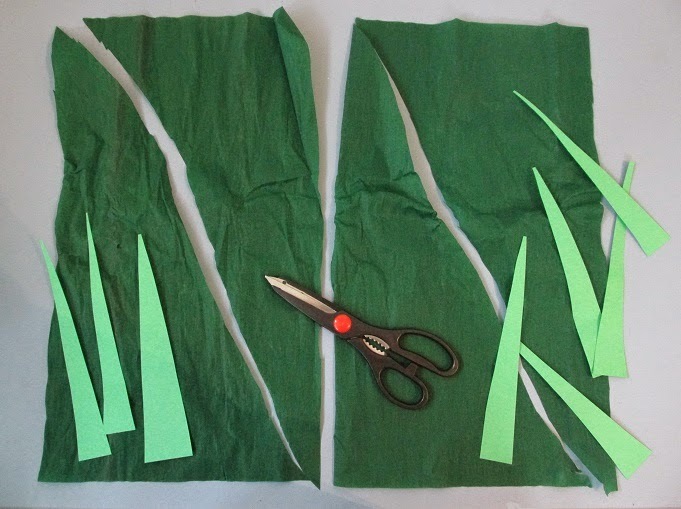 We had light and dark green tissue paper. I thought I'd show you both so you can decide which shade of green you like best. Want to download this printable? Hi Jen! Thanks for visiting and glad you like it! I see you just moved your blog! Cute name! Looking forward to seeing some new posts! 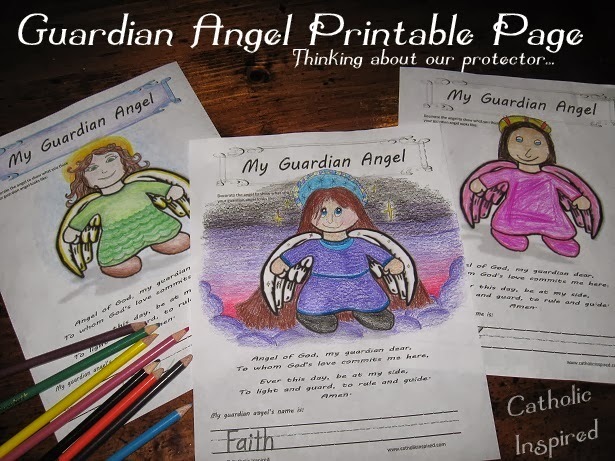 Love this activity, I'm going to do it with our homeschool group this week, thank you! Wonderful! Hope you all enjoy it! God Bless!